Thanks to everyone who has taken the time to follow my blog. This is a friendly reminder to anyone who has “forgotten.” That includes YOU, Mom. Sign up by clicking on the “Follow My Blog” button on the right side of my homepage by November 5, 2015 to be eligible for the First Friday Giveaway. Winner announced on November 6, 2015. 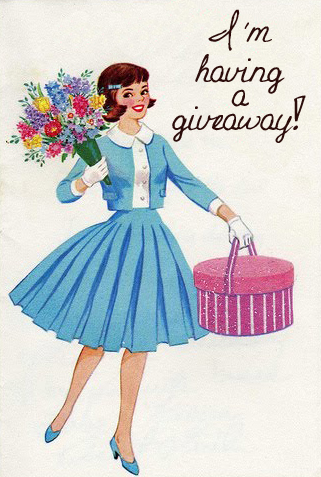 For the first First Friday Giveaway, the winner of the raffle will receive a $25 gift certificate to Vintage Nest for in-store or online purchase. Please see the “Events & Media” page for more details. Guys, don’t be shy–Win this and you will score big points with your ladies. They love “Just Because” presents from Vintage Nest. As an added bonus, all followers will receive an extra entry in the raffle for a “Comment” made to any one of my blog posts (1 entry for following blog, 1 entry for any comment made, for a total of 2 entries per person for the November 6th giveaway. More incentives coming in December). Make sure you post this to Twitter and/or Facebook for maximum buzz!